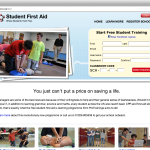 Blended First Aid at Work courses launched by ProTrainings. We are the first to launch the new HSE option for EFAW and FAW courses in the workplace. We have introduced all options for these courses including, Driver CPC, Equestrian and Forestry versions of the courses. Blended training means you can reduce the time training has to be completed in the classroom by completing part of your training online using our full feature video online training. Blended training is nothing new to ProTrainings, we have been delivering it for many years. We already have blended Basic Life Support, AED and our popular Paediatric First Aid courses. Our video based training is more engaging that PowerPoint based training courses. ProTrainings trade body qualification or a regulated qualification are available. List the website at www.profaw.co.uk where you will find more information and where you can sign up for the course. Watch a series of short videos, answer knowledge review questions and complete the test. All courses include a student resources section to download the free student manual and many other downloads and links. On completion of the online part you can instantly download and print your completion certificate. Because free downloadable evidenced based learning statement and Certified CPD statement are included, therefore ProTrainings course are comprehensive. We have also added subtitle to some of the videos using the CC option and all videos will be available with subtitles soon. The part two of the course is where you complete the practical part of your course. Half day for an EFAW, two days for a First Aid at Work and one day for the First Aid at Work re-qualification. When you complete part two, you will receive your ProTrainings certificate in the post from your instructor. We have hundreds of approved and monitored instructors nationally who can deliver part two of the course locally or at your workplace. We also offer the Appointed persons course which can be completed 100% online and the HSE recommended First Aid at Work annual refresher which again can be completed 100% online. Our blended first aid at work training is available to individuals, companies and instructors to offer to their students. For more information please email support@protrainings.uk or call ProTrainings on 01206 805359.